How do we typically train students to process coursebook texts? Well, we have our lead-in, our gist question(s) and then the detailed information questions before moving along to the language input stage. Right? Wait a minute. Aren’t we missing something here? Where do the students’ opinions about the text come into this? Whenever we read something, we form an opinion about it, don’t we? As T.S. Eliot would have it, “criticism is as inevitable as breathing”. When we ignore this, therein lies the cookie cutter. Don’t get me wrong – I’m not saying that there are no teachers out there who ask their student’s opinion, what I am asking is how do we make sure that they can all get involved without the rearing of the dreaded Affective Filter and therefore maximise their learning opportunities through communication? After all, any teacher who’s decided to have a speaking class knows that there are naturally some students who will get involved more than others – this should hardly be a surprise: in any social gathering of any kind, you find the same kinds of people, this is not particular to the classroom. Well, this requires a little training. What I am proposing is something that students (who typically process texts through gist and further information questions before moving straight on to language input) are not necessarily used to doing. So I’ll call this involvement language training – it’s a technique I’ve been using with an advanced level adult class and a pre-intermediate younger learner’s class and it has worked wonders for their communication. This concept of Problematisation is adapted from Foucault’s work on critical thinking, which suggests a level of “reading into” the text using a set of questions, thus stepping back from it and re-evaluating it, leading to a change in one’s face-value perspective. 1) What is the message the text is giving? 2) Who is giving this message? 3) Who is he or she giving this message for? 4) Why is he or she giving this message here and now? 5) Who does this message benefit? 6) Who does this message hurt? Once the students have been set these questions, the second stage is to Group the students in small groups or pairs (to lower those Affective Filters) and set a time of three-five minutes so that they have a clear goal and a time-frame (no sooner or later, so you don’t get students saying, “finished” after one minute!) within which to achieve it. The students then Collaborate and answer these questions as they see fit, writing down the answers that they come up with. In the meantime, you are monitoring for delayed correction. 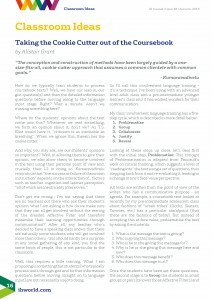 This stage is crucial in the process in that it gives students a specific yet achievable critical-thinking goal which allows them (and indeed demands that they) communicate with each other, without your needing to pick students out to speak or fend-off the enthusiasm of more active learners in open class. Justify: once the time is up, the groups nominate one student to report back to the class on their thoughts, during which the rest of the class note down whether their ideas are similar or different to those theirs, so as to avoid any “dead time” for them. Encourage some open-class debate at this stage – I have found that even the more reticent learners, having considered their answers, are far more prepared to participate. These are the fashions that exist today for young people. Journalists from a magazine for young people. 3) Why is he or she giving this message here and now? To tell teenagers about fashions and to make them interested in the clothes and styles. 4) Who does this message benefit? Teenagers thinking about a way to dress and to be part of a group. 5) Who does this message hurt? Teenagers who think they have to be part of one group, or they feel like losers. Maybe it makes teenagers buy a lot of clothes. Adults who read the magazine, because they will have prejudice about the clothes people wear and they judge them because clothes and style. They will maybe be scared of Townies or Goths because they look scary. Finally, the Reveal stage is (apart from the bit where you feedback to the students with common errors that you have been boarding and get them to self/peer-correct) where you ask your students what they have learned from each other about the topic of the text. This stage means that they can genuinely share each other’s considered opinions, rather than spur-of-the-moment remarks. You are then ready to tackle whatever language point the text is “pushing”, having first ensured that the students are not only engaged but involved in the topic from a personal (and critical) perspective, rather than going for the language input having merely made sure they understand what the text is about. Try it. See how you and your students react to the experience and if it works for them and you, try it again. The tool is there to be used (or discarded!) as you see fit. This involvement language training is not a method or approach or a call to arms for any kind of overthrowing of anything at all: it’s simply about making the exercises involving and productive for the students so they process them by communicating, which is, after all, what we all learn a language for. As I said above, any text has an agenda on some level (otherwise, what’d be the point in it being written?) 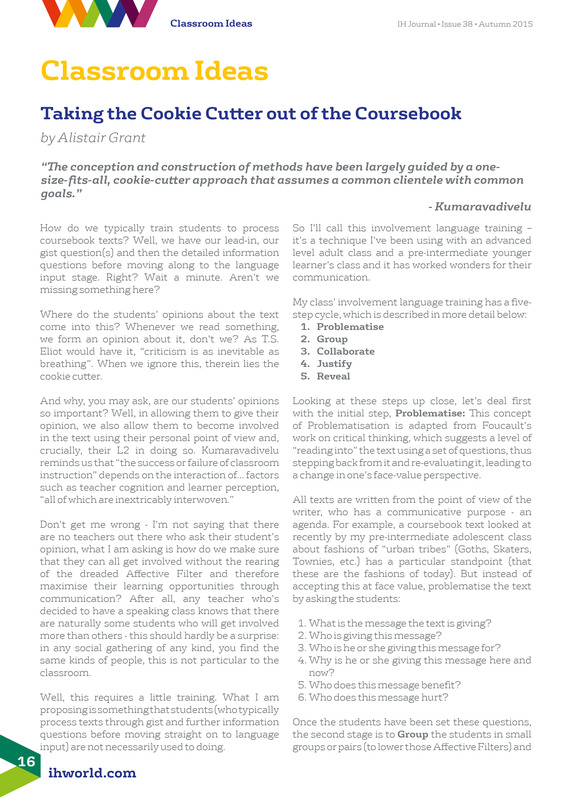 and training our students to get involved and analyse these agendas and communicating in the L2 at the same time means that coursebook texts can be goldmines of ELT learning, rather than tools to squish our students with the same cookie cutter. Eliot, T.S., The Use of Poetry and the Use of Criticism, 1964 edition, Cambridge: Harvard University Press. Foucault, Michel. 1979, 1976. The History of Sexuality Volume 1: An Introduction. London: Allen Lane. Krashen, S. 2003. Explorations in Language Acquisition and Use. Portsmouth: Heinemann. Alastair Grant is a Teacher and Teacher Trainer at International House San Isidro. He holds an Honours Degree in English Literature and Philosophy from the University of Warwick and has completed all modules of the Cambridge Delta. His special interests are Process Writing, Discourse analysis and trying to decide between Cabernet Sauvignon and Pinot Noir. Back to Issue 38: Autumn 2015 of the IH Journal of Education and Development.